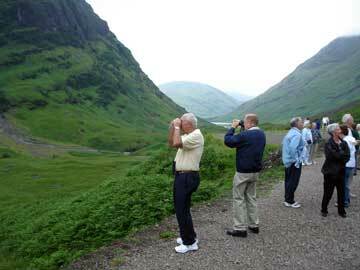 Scotland's Blue Riband Travel Company is here to assist you with all your travel plans to Scotland. We have over 20 years experience in tailor making travel arrangements that are personal to you. Read a few of our clients comments. For sample tour itineraries, fill in our quick form. Whether your interests are golf, fishing, walking, cycling, shooting mountaineering, watersports, horse riding or just site-seeing, the staff at Blue Riband are dedicated to providing all their clients with a stress free holiday. They check all aspects of the accommodations and tours regularly to ensure the Blue Riband standard is met. Blue Riband Groups Department can cater for groups of all sizes and budgets. Our services include accommodation, Itinerary planning, luxury coaches of all sizes, driver guides and bi lingual tour guides. Contact us for more information. We at Blue Riband Accommodation, strive to provide the exceptional service iterated by the Blue Riband high standard. Our accommodations, tours and transport are second to none, providing quality accommodation at all levels, first rate travel and an insight into Scotland that is beyond compare. Blue Riband Accommodation is owned and operated by Scottish Travel & Tourism.